You do great things with tone. Thank you so much Graham, I appreciate your comment. The photographs are mesmerizing. Glad I didn’t have to drive either. Thank you for sharing them. oh wow – Karen, I have really enjoyed these. The second image is wonderful. And the last two are very beautiful. 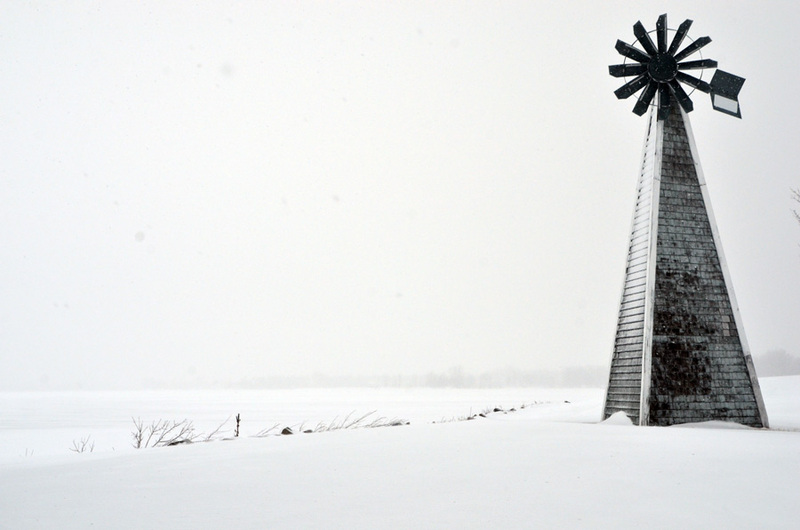 The windmill- need I say more? Such beauty, with the faint wisps of grass. And the last image – those leaves are holding on; red/orange and alive. Your work is simply stunning. Thank you so much! PS Image 4 – I also like the antiquated look or are they snowflakes? WordPress really should make a LOVE button! Thank you so much I’m happy you like them! I like the look of the snow on the lens. Like the rain, it adds another dimension. Karen – you need your own gallery 🙂 Maybe in NY?! Karen these are all breathtaking. Your composition, tone, and eye-gorgeous. 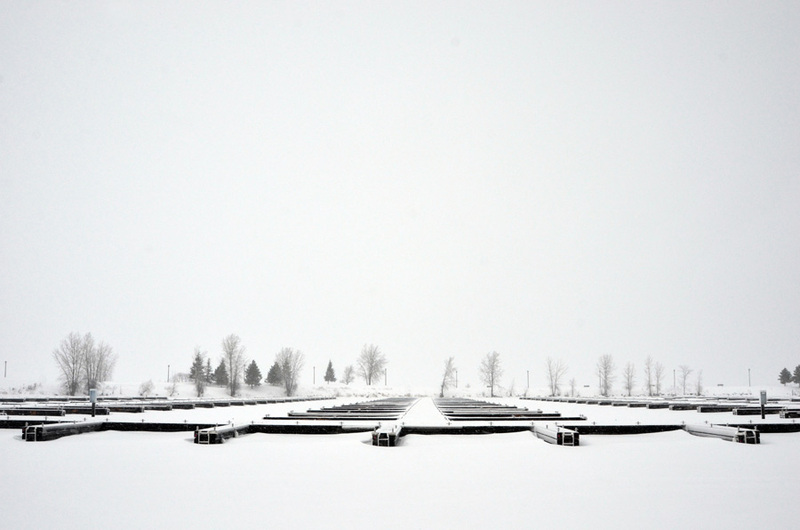 I think I’m a minimalist at heart so winter really affords those opportunities for pared down landscapes. Thank you Elena. Love the lines in all of these K. Nice work. These ones are beautiful in a very different way from the wrapped trees. In these, the subjects aren’t as human-like as they are *elemental* (at least to me). The tree in the first photo seems so… inevitable. That’s my favorite. Yes, a completely different feel. Thank you. Single tree sandwich. I especially like the first one, and there’s something delicious about those lingering red leaves in the last one – like candy or something – shards of caramel that’s it. 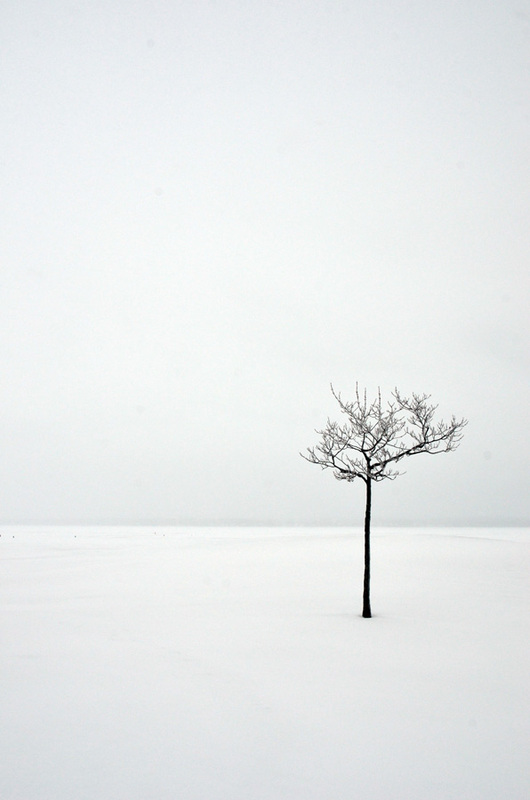 The first one left me breathless – the image of the single tree, so metaphoric. My favourite too. Thank you Jane. Thanks Distan, so different from what you are photographing these days. Those ocean scenes are glorious! Also I completely understand about the weather — here in Minnesota, it occupies about 80% of our conversation. I have recently found your blog, and I find your images haunting…meaning unforgettable . Today as I was driving home from the farm, I suddenly saw in my mind’s eye…an image from your wrapped trees series. These lone tree figures, for me, are a minimalist tribute teasing me to think about the richness of spring, which is almost here. I am deeply moved by your work; the images speak. Hi Sher, thank you so much for your extremely kind comments. It’s always nice to hear when other people appreciate your work and that it resonates with them. If an image sticks in our head then I am thrilled. Amazing photos. 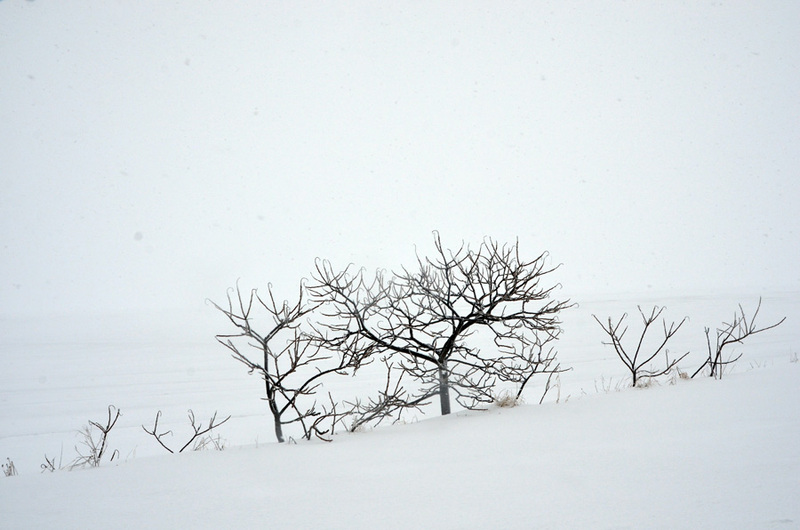 There’s something about trees in winter – black branches against the white. Where in Canada? Hi Lois, I am in Ottawa, Ontario. Thank you for your comment! Yum! I now live in NY (where we never seem to get snow anymore), having grown up in Toronto….these gorgeous pix made me a little homesick. These are really beautiful. I love your minimalistic approach. You can feel the cold. Amazing ! Such quiet beauty in the landscape. That first one just grabbed me. The stark outline of the bare tree against the snow and just a bit different shade sky is wonderful. simply brilliant, been reading a lot of blogs today and the photo’s are awesome ,, these are on top of the pile though. Involuntary sharp intake of breath when I scrolled down the page and saw that lone tree, then the 2nd photo – not sure what it is but love it all the same and the last. Perfection … you have the eye of all eyes Karen. Wow Helen, that is such a nice thing to write. 🙂 I’m truly touched. thank you so much! The second photo is docks in the frozen harbour. Especially #1,4 and 5 !!! The first and the last especially are stunningly beautiful in their simplicity. I love the gentleness of your palette. I used the term ‘poetic’ previously when commenting on your photos. I would use it again to describe this selection. that first shot is just perfect. Thanks you brighten my day with it. Such stark beauty, every one. Incredibly beautiful photos that are truly inspiring! Love them all and the simplicity of them. Wow, these are incredible, Karen! The white clad minimalism works like an absolute dream, and I’m seriously, and utterly blown away by this collection. Those are some gorgeous shots! Reminds me of an exercise we were put through in the first year of architecture school in which we had to analyse negative and positive spaces in photographs. Your more-than-just-awesome shots would have been perfect specimens actually! So simple yet you have made them look so beautiful and mainly only two colours. Superb. These are all gorgeous, and chilly, but I really love the first one! Incredible, as always. 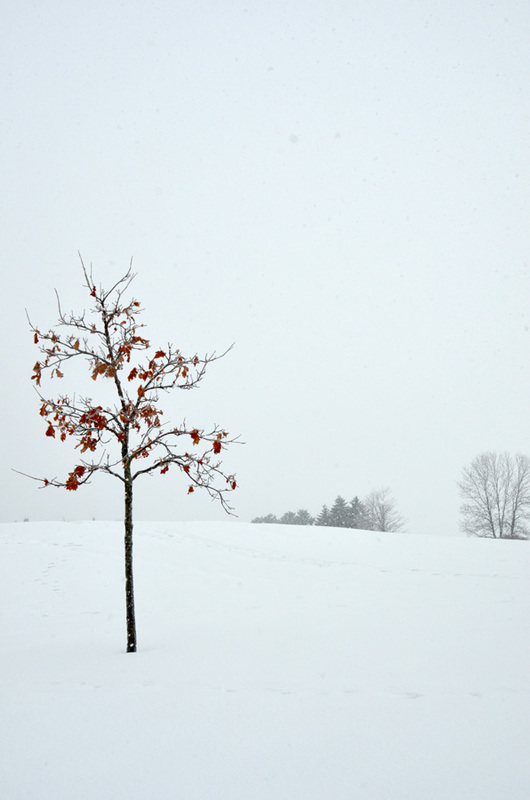 I love the first one of the lone tree against the wintery landscape. Terrific shots, and a terrific way to speak of the weather. I will have to take a page out of your book – more showing, less saying 🙂 I like them all, but if I to choose it would be between the first one and the two trees one. I really like the simplicity of these. You are unique, your shots have a singular meaning, find the poetry in the landscape. Karen, really incredible work. That first frame blew me away, it’s absolutely other-worldly. I especially love the first one. Great composition! Your photos are very evocative. The first and fourth photos instantly brought on an emotion (loneliness and determination for the first, and love and contentment for the fourth). Oh no, I’m so deeply in love with winter, and snow and ice, so I appreciate your photos very much. That first photo is truly great. Print it out and put it in a nice thin black frame and stick it on your wall, if you haven’t already! Thanks for all the comments friends, I appreciate every one of them! Hi Karen – Minimalist and truly graphic! Beautifully composed and sharp! Love them, Karen! Another fine set! We in Britain also have a reputation about not just talking about, but moaning about, the weather, because it is just so changeable – mostly cold, drich, wet and windy though – well maybe not on the warm, sunny, dry and still ones – or on the foggy and still ones – or when it is snowing!!! See what I mean…? These are incredible. That first one is perfect…it deserves it’s place on the wall. Very, very stunning! Yes Shez, it is an oak. They hold on to their leaves for dear life! How beautiful a series. The first is my very favourite. I like a single figure in a landscape – human or arboreal. 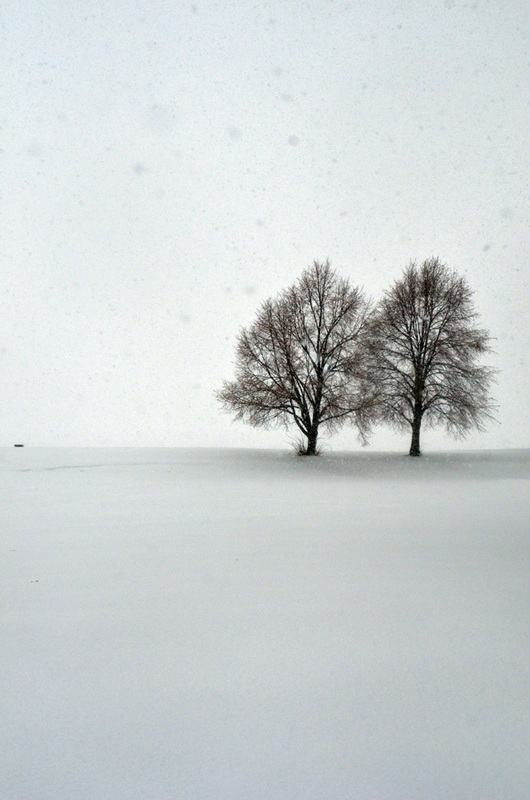 The two tree one is wonderful too – like two friends. What a fantastic first image!!! Your beautiful images make me miss winter. (I’m a transplanted Canadian now in California)… thank you for sharing your amazing work. Thanks so much, Deb. Your comments are lovely and appreciated. I am a winter girl for sure but it’s been pretty cold so California sounds pretty great too!